One of the best destinations for who chooses to visit Florence is undoubtedly Palazzo Vecchio, the great building that historically hosted Florentine civil power. No doubt, the best way to visit Palazzo Vecchio in Florence is to book a guided tour. Palazzo Vecchio is an incredibly fascinating place to visit, full of hidden treasures. Ensure not to miss many of its wonderful rooms, with frescoes and pieces of art. Enjoy your hours spent here! The first stop of the visit to Palazzo Vecchio should be the Michelozzo Courtyard. Just like its name explains, this courtyard was designed by Michelozzo in 1453. In the ceilings and walls of the gallery you can find the spectacular frescoes painted by Giorgio Vasari in 1565 for the wedding celebrations of Francesco I de’ Medici. The whole courtyard of Michelozzo is completed by a beautiful fountain placed in the center, which was installed in 1557 to replace an old well. At the top of the fountain there is a small sculpture, known as the Angel with the Dolphin, made by Verrochio. But without any doubt, the Great Hall of the Five Hundred is the room that best reflects the grandeur of Palazzo Vecchio and of the Old Republic of Florence. You can admire its huge dimensions and see numerous works of art, and then proceed to the Monumental Rooms, with its majestic decorations. Among them there’s the Pope Leo X Hall, dedicated to the son of Lorenzo de’Medici, one of the most important members of the Medici Dynasty (XV century), which is used as a living representation of the Florence City Council. On the ceiling of the Leo X Hall, large rectangular panels with allegorical paintings of his life can be seen, while the walls are decorated with wonderful paintings. Another of the exceptional rooms of Palazzo Vecchio is the so-called Clement VII Hall, another pope of the Medici dynasty, also decorated with great paintings. But besides these rooms, on the second floor there are other beautifully decorated rooms. To get there, you will have to climb one of the most spectacular corners of Palazzo Vecchio, the monumental Vasari’s Stairway. Look at the ceiling, because these incredible decorations are really not to be missed. Also worth a visit the Lily’s Roomv, because of its beautiful floral decorations. You can also see some frescoes by Domenico Ghirlandaio, as well as one of the masterpieces of Donatello, Giuditta and Oloferne. 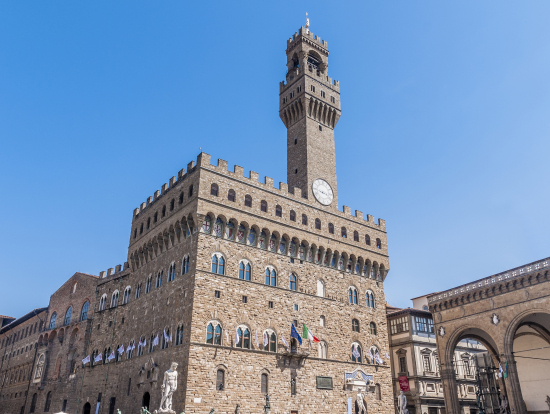 Click here for more information about the guided tour of Palazzo Vecchio.